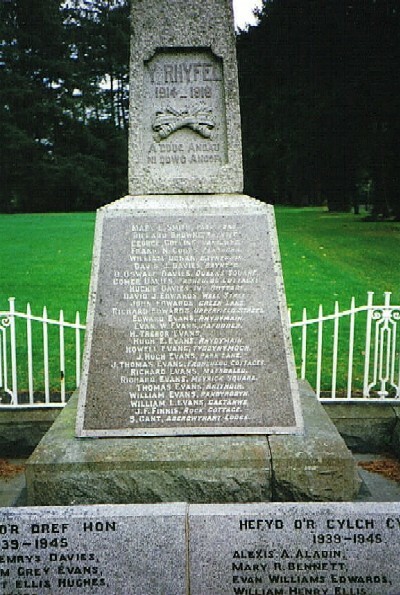 The Memorial is in the park by the bridge. The house names have been included for some of the men or the surrounding villages and hamlets for those in the outlying areas, these are in brackets. There is a smaller memorial in the Parish Church. Twenty six names were added to the memorials for those who fell in World War 2. (Paynteg) Airman 3rd Class 92780, 55th Kite Balloon Section. Royal Flying Corps. Egypt. Killed in action in Palestine on the 31st December 1917. Age 33. Son of Richard and Ellen Browne of Maestalaran, Dolgelley. Husband of Madge. Browne of ‘Roslyn’ Dolgelley. Commemorated on The Chatby Memorial, Alexandria, Egypt. MR. 41. (Ganllwyd) Private 22042, 2nd Battalion, The Kings Own Shropshire Light Infantry. 27th Regular Division, Macedonian Front. Killed in action in Greece 11th June 1917. Brother of Miss Annie Collins of Tyn-Y-Groes Cottage, Ganllwyd, Dolgelley. Born in Dolgelley and enlisted in Market Drayton, Leicestershire. Buried in Mikra British Cemetery, Kalamaria, Salonika. Greece. Gr., 9. (Plasocra) Sergeant 8676, ‘D’ Company, 11th Battalion, The Cheshire Regiment. 25th Northern Division. Killed in action on the Somme 17th July 1916. Aged 28. Husband of Mrs. Alice Ann Coops of Hawthorn View, Lindow, Cheshire. Regular soldier with 8 years service in India. Born Alderley Edge, Cheshire and enlisted in Chester. Buried in Puchvillers British Cemetery. F. 74. (Froheuedg Cottages) Private TF/290537, 7th Battalion, The Royal Welsh Fusiliers. 53rd Welsh Division Killed in action in Palestine 29th March 1918. Born in Dolgelly. Next of kin, Dolgelley. Commemorated on The Jerusalem Memorial MR. 34. (Well Street) Corporal 6237, 3rd Garrison. Battalion, The Royal Welsh Fusiliers. Home Command Died at home on the 20th November 1918. Aged 40. Son of Mrs. Dorothy Anne Parkes of 5, Aber View, Corwen, Merionethshire. Born in Dolgelley. Buried in Dolgelley St. Mary Churchyard Extension. (Green Lane) Private 2694, 7th Battalion, The Royal Welsh Fusiliers. 53rd Welsh Division. Killed in action at Suvla Bay 10th August 1915. Born and enlisted in Dolgelley. Commemorated on The Helles Memorial, Gallipoli. MR. 4. (Upperfield Street) Private 2739, 7th Battalion, The Royal Welsh Fusiliers. 53rd Welsh Division. Killed in action at Suvla Bay on the 10th August 1915. Born and enlisted in Dolgelley Commemorated on The Helles Memorial, Gallipoli. MR. 4. (Rhydymain) Private TF/291469, 2nd Battalion, The Royal Welsh Fusiliers. 33rd Division. Killed in action at Bullecourt 27th May 1917. Aged 25. Son of John and Jane Evans of Blaenyddol, Rhydymain, Dolgelley Born Rhydymain. Enlisted in Dolgelley. Commemorated on The Arras Memorial MR. 20. (Hafddoer) 2nd Corporal 185934, ‘N’ Special Company, The Royal Engineers. Killed in action in the Ypres Salient 17th November 1917. Enlisted in Montgomery. Next of kin, Dolgelley. Buried in Steenkerke Belgian Military Cemetery. (Rhydymain) Private 81734, 36th General Hospital, Royal Army Medical Corps. Salonikan Front, Greece. Died of disease in Greece 28th October 1917. Aged 23. Son of Griffith and Mary Anne Evans of Glan Eiddon, Rhydymain, Dolgelley. Born Llanfarchreth Enlisted in Rhyl. Buried in Mikra British Cemetery, Kalamaria, Salonika, Greece. 9. (Park Lane) Private TF/290581, 7th Battalion, The Royal Welsh Fusiliers. 53rd Welsh Division. Killed in action at Gaza, Palestine 26th March 1917. Aged 34. Son of John and Margaret Evans of 5, Park Lane, Dolgelley. Born and enlisted in Dolgelley. Commemorated on The Jerusalem Memorial. Palestine. MR. 34. (Froheulog) Lance Corporal TF/240742, 1/5th Battalion, The Welsh Regiment. 53rd Welsh Division. Killed in action at Gaza, Palestine. 26th March 1917. Born in Dolgelley and enlisted in Pontypridd. Commemorated on The Jerusalem Memorial. Palestine. MR. 34. (Maescaled) Private 38128, ‘D’ Company, 18th Battalion, The Welsh Regiment. 40th Division. Killed in action at Cambrai 25th November 1917. Aged 27. Son of Edward and Elizabeth Evans of 4, Maescaled, Dolgelley. Born Afonwen. Enlisted Tonypandy. Resident of Blaenclydach, Glamorgan Commemorated on The Cambrai Memorial MR. 17. Private 7264 (Bontyrarran or Meyrick Square 2nd Battalion, The Welsh Regiment 1st Division Wounded in action near Givenchy and died in military hospital At Boulogne on the 27th February 1915. Born Dolgelley and enlisted in Cardiff. Res. Cwmdare, Glamorgan Buried in Boulogne Eastern Cemetery F. 102. (Brithdir) Private 89615, 13th Battalion, The Royal Welsh Fusiliers. 38th Welsh Division. Died of wounds 29th October 1918. Aged 20. Son of Edward and Elizabeth Evans of 3, Micrion Terrace, Brithdir. Born in Dolgelley and enlisted Wrexham. Buried in Etaples Military Cemetery. F. 40. (Pandyrodyn) Private 125219, 223rd Divisional Employment Company, The Labour Corps. Formerly with the Kings Liverpool Regiment. Died on active service in Italy 17th October 1918. Aged 30. Son of Richard and Winifred Evans of 21, Maengwyn Street, Towyn. Enlisted in Dolgelley. Buried in Dueville Communal Cemetery Extension, Italy. (Caetanws) Private 2824, 7th Battalion, The Royal Welsh Fusiliers. 53rd Welsh Division Killed in action at Suvla Bay, 10th August 1915. Aged 34. Son of Robert and Margaret Evans. Husband of Mrs. Elizabeth Evans Who remarried and lived at 19, Pentre Road, Mardy, Glamorgan. Born in Dolgelley and enlisted in Newtown. Commemorated on The Helles Memorial, Gallipoli. MR. 4. (Rock Cottage) Stoker 1st Class K/16255, H.M. Submarine ‘L.55’ Royal Navy. Lost with the ship in the Baltic 9th June 1919. Aged 28. The remains of the crew (42) were brought home in September 1928 and buried in a communal grave in Portsmouth. Son of Henry Joseph and Agnes Finnis of 191, Lancaster Road, New Barnet, Herts. Born Teddington, Middlesex. Buried in Haslar Royal Naval Cemetery, Hampshire. (Abergwynant Lodge) Private 36219, 9th Battalion, The Leicestershire Regiment. 21st Division Killed in action in the Ypres Salient 1st October 1917. Aged 31. Son of William Henry and Mary Anne Ganr of Coningsby, Lincs. Husband of Lizzie Gant of The White House, Caversham, Reading. Born in Coningsby and enlisted in Leeds. Formerly with the West Yorkshire Regiment Commemorated on The Tyne Cot Memorial, Belgium MR. 30. (Glan Wynion) Private 26874, 7th Battalion, The Kings Own Shropshire Light Infantry. 3rd Regular Division. Killed in action at Ypres 26th September 1917. Aged 27. Son of David and Elizabeth Griffith of Dolgelly. Born in Dolgelley and enlisted in Denbigh. Commemorated on The Tyne Cot Memorial, Belgium. MR. 30. (Glan Wynion) Private TF/203628, 4th Battalion, The Royal Welsh Fusiliers. (Reserve Battalion). Died at Home 26th February 1917. Aged 22. Son of Thomas and Mary Griffith of Tan y Merddyn, Ceunant, Llanrug, Carnarvon. Born Beddgelert and enlisted Portmadoc. Buried in Beddgelert New Cemetery, Carnarvonshire. (Rhydymain) Private 60263, 9th Battalion, The Welsh Regiment. 19th Western Division. Killed in action 20th December 1917. Aged 20. Son of David and Elizabeth Griffith of 2, Penybont, Rhydymain, Dolgelly, Merionethshire. Born and enlisted in Dolgelley. Commemorated on The Thiepval Memorial. MR. 21. (Talyrafon Buildings) Private 39515, 14th Battalion, The Royal Welsh Fusiliers. 38th Welsh Division. Killed in action at Ypres 21st September 1917. Aged 19. Son of Henry and Kate Griffiths of 3, Talyrafon Buildings, Dolgelley. Born and enlisted in Dolgelley. Commemorated on The Tyne Cot Memorial, Belgium. MR. 30. (Penmaen) Private 76278, ‘D’ Company, The Tank Corps. Killed in action at Arras 11th April 1917. Aged 24. Son of Frederick William and Elizabeth Harness of Rose Cottage, Wainfleet, Lincolnshire. Employed as a gardener in Dolgelley. Born in Wainfleet, Lincolnshire. Enlisted in Dolgelley. Commemorated on The Arras Memorial MR. 20. (Union Square) Private 3410, 7th Battalion, The Royal Welsh Fusiliers. 53rd Welsh Division. Killed in action at Suvla Bay 10th August 1915. Aged 22. Son of Mrs. Mary Williams of 4, Cader Road, Dolgelley Born Llwyngwril. Enlisted in Dolgelley. Commemorated on The Helles Memorial, Gallipoli. MR. 4. (Siloh) Private 49585, 1/5th Battalion, The South Wales Borderers. 19th Western Division (Pioneer Battalion). Wounded in action on the Marne Front and died of wounds on the 30th May 1918. Aged 19. Grave lost. Born Blaenau-Festiniog and enlisted in Dolgelly. Son of William and Ann Hughes of 91, The High Street, Blaenau-Festniog. Commemorated on The Soissons Memorial MR. 18. (Well Street) Gunner 137649, 59th Anti Aircraft Section, Royal Garrison Artillery. Died in the Persian Gulf 15th March 1918. Aged 36. Husband of Lilian Humphreys of 20, Bromley Gardens, Bromley, Kent. Born in Dolgelley and enlisted in Portsmouth Son of Mr. and Mrs. Humphreys of Well Street, Dolgelley. Buried in Bagdhad (North Gate) War Cemetery, Iraq. (Well Street) Private 6037, 1st Battalion, The Royal Welsh Fusiliers. 7th Division. Killed in action at Festubert 16th May 1915. Son of Mr. and Mrs. Humphreys of Well Street, Dolgelley. Born in Dolgelley and enlisted in Wrexham Commemorated on The Le Touret Memorial. MR. 22. (Market Hall) Private 39079, 21st Battalion, The Royal Welsh Fusiliers Reserve Battalion. Died at home 19th April 1916. Aged 29. Born in Dolgelley and enlisted in Hull. Son of John and Mary Anne Humphreys of Dolgelley. Buried in Dolgelley Nonconformist Cemetery. (South Street) Corporal 59522, 4th Battalion, The Kings Liverpool Regiment. 33rd Division Killed in action 20th September 1918. Born in Dolgelley and enlisted in Seaforth, Liverpool. Commemorated on The Vis en Artois Memorial MR. 16. (Rhydymain) Private 35441, 10th Battalion, The Royal Welsh Fusiliers. 25th Division. Killed in action on the Somme 28th November 1916. Born in Dolgelley and enlisted in Holborn, London. Buried in Euston Road Cemetery, Colincamps. F. 156. (Rhydymain) Lance Corporal 35371, 10th Battalion, The Royal Welsh Fusiliers. 25th Division. Killed in action on the Somme 16th August 1916. Born in Dolgelley and enlisted in Holborn, London. Buried in Guillemont Road Cemetery, Guillemont. F. 294. (Penbrynglas) 2nd Corporal 121728, 183rd Tunnelling Company, The Royal Engineers. Died of wounds sustained in the Ypres Salient, 20th July 1917. Aged 35. Son of Cadwaladr and Jane Jones of Arran Road, Dolgelley. Husband of Annie Ellen Jones of Meiron House, Tan-y-Grisiau, Blaenau Festiniog. Born in Dolgeley and enlisted in Blaenau Festiniog Buried in Dozinghem Military Cemetery. Westvleteren, Belgium B. 16. (Gaertyddyn) Two Possibles, either David Jones, Private 2820. 1st Battalion, Welsh Guards. Killed in action 20th July 1918. Born Abertrient and enlisted in Dolgellau. Or David Thomas Jones, Private 61078, 2nd Royal Welsh Fusiliers. Killed in action 8th January 1918. Born Llanuwchllyn and enlisted in Dolgellau. (Park Lane) Private 11027, 1st Battalion, The Royal Welsh Fusiliers. 7th Division. Died of wounds 17th May 1915. Born in Dolgelley and enlisted in Wrexham. Next of kin, Dolgelley Buried in Lillers Communal Cemetery F. 201. (Derwen House) Sub Lieutenant, H.M.S. ‘Indefatigable’, Royal Navy. Grand Fleet Battlecruisers. Lost when the ship blew up at the Battle of Jutland 31st May 1916. Aged 23. Son of Evan and Frances B. Jones of Derwen House, Dolgelley Native of Ventnor, Isle of Wight. Commemorated on The Plymouth Naval Memorial. MR. 2. (Bontyrarran) Lance Sergeant 2620, 1/7th Battalion, The Royal Welsh Fusiliers. 53rd Welsh Division. Killed in action at Suvla Bay, Gallipoli 10th August 1915. Next of kin Arran Road. Parish Church Memorial. Born and enlisted in Dolgelley. Commemorated on The Helles Memorial, Gallipoli. MR. 4. (South Street) Private 93935, ‘A’ Company, 16th Battalion, The Royal Welsh Fusiliers. 38th Welsh Division Killed in action near Crevecoeur sur L’Escaut 8th October 1918. Aged 19. Born Blaenau Festiniog and enlisted in Corwen Son of Mr. and Mrs. Lewis Jones of 3, Bryntawel, Glan Y pwll. Blaenau Festiniog. Buried in Bois Des Angles British Cemetery. Crevecoeur Sur Lescaut. (Taigynhaeaf) Private 49882, 13th Battalion, The Royal Welsh Fusiliers. 38th Welsh Division. Died of wounds near Fienvillers. 27th August 1918. Son of Hugh and Jane Jones of ‘Ty Newydd’ South Street, Dolgelley Born in Dolgelley. Enlisted Seaforth, Liverpool Next of Kin Bootle, Lancashire. Buried in Fienvillers British Cemetery. (Clywedog) Private 52043, 13th Battalion, The Cheshire Regiment. Killed in action near Ypres 10th August 1917. Born Dolgelley and enlisted in Uxbridge. Commemorated on The Menin Gate Memorial, Ypres, Belgium. MR. 29. (Ochryfoel) Private 2738, 1st Battalion, The Welsh Guards. The Guards Division. Killed in action near Ypres, Belgium 18th July 1917. Aged 26. Son of Gwen Jones of Ochryfoelucha. Born and enlisted in Dolgelley. Buried in Canada Farm Cemetery, Ypres., Belgium. B. 12. (Bontyrarran) Private 34858, 1st Battalion, The Kings Shropshire Light Infantry. Killed in action in the Ypres Salient 13th August 1918. Born Silvington, Shropshire and Enlisted in Highley, Shropshire. Buried in Abeele Aerodrome Military Cemetery, Belgium. Also commemorated on the Parish Church Memorial. (Park Lane) Private 144765, No. 38 Company, The Machine Gun Corps (Infantry). Killed in action during the final advance 19th September 1918. Born in Bala and enlisted in Dolgelley. Next of kin, Bala. Commemorated on The Vis en Artois Memorial MR. 16. (Tanycoeden) Lance Corporal 25214, 17th Battalion, The Royal Welsh Fusiliers. 38th Welsh Division. Killed in action near Elverdinghe. Belgium 13th February 1917. Aged 39. Son of Mr. and Mrs. William Jones of Dolbryn House, Glany Pwll Road, Blauenau Festiniog. Born and enlisted Blaenau Festiniog. Buried in Ferme Olivier Cemetery, Elverdinghe, Ypres. Belgium. B. 1. (Fron Goch) No further information currently. (Arcoed) Lieutenant, 20th Deccan Horse. Indian Army. Killed in action 13th June 1917. Commemorated on The Neuve Chapelle Memorial MR. 28. (Rhydymain) Lance Corporal 36904, 233rd Company, The Machine Gun Corps. Killed in action at Ypres 4th October 1917. Aged 21. Son of Mr. and Mrs. Thomas Nelson Marchany of Railway Cottage, Rhydymain, Dolgelley. Born and enlisted in Dolgelley. Commemorated on The Tyne Cot Memorial, Belgium MR. 30. (Bryncoedifor) Private 16769, 13th Battalion, The Royal Welsh Fusiliers. 38th Division. Killed in action 29th October 1916. Aged 24. Born in Breage, Cornwall and enlisted in Wrexham. Resident of Dolgelley. Son of Samuel and Mary Martin of Trewent, Altamon, Launceston, Cornwall. Buried in Essex Farm Cemetery, Ypres, Belgium. B. 73. (Park Row) Private 30193, 8th Battalion, The Northumberland Fusiliers. 11th Division. Died of wounds 9th October 1918. Buried in Etaples Military Cemetery, F. 40. (Tudno Villa) Private TF/291272, 7th Battalion, The Royal Welsh Fusiliers. 53rd Division. Killed in action at the First Battle of Gaza, Palestine 26th March 1917. Born Dolgelley and enlisted in Towyn. Buried in Gaza War Cemetery, Palestine. (Dregerric) Private TF/290464, 7th Battalion, The Royal Welsh Fusiliers. 53rd Welsh Division Killed in action in Palestine 6th November 1917. Aged 27. Son of Lewis and Catherine Owen of 13, Llanegryn Street, Abergwynolwyn, Merionethshire. Buried in Beersheba War Cemetery, Palestine. (Bryngwenailt) No further information currently. (Froncaled) Private TF/241432, 1/5th Battalion, The Royal Welsh Fusiliers. 53rd Welsh Division. Killed in action during the first Battle of Gaza, 26th March 1917. Aged 23. Son of Mr. G. H. and Mrs. A. Owen of ‘Briesea’ Upper Berfield Street, Dolgelley. Born in Beddgelert. Also on the Parish Church Memorial. Buried in Gaza War Cemetery, Palestine. (Park Lane) Sergeant 28704, ‘C’ Battery, 75th Brigade, Royal Field Artillery. 16th Division Killed in action at Cambrai 30th November 1917. Aged 21. Son of Mrs. Elizabeth Owen of 3, Smithfield Lane, Dolgelley. Born in Dolgelley and enlisted in Abergavenny. Commemorated on The Cambrai Memorial, Louveral. MR. 17. (Maestelarran) Private G/13357, 6th Battalion, The Royal West Kent Regiment. 12th Division Died of wounds at Rouen April 1st 1918. Aged 24. Son of William and Esther Owen of 16, Talarran Terrace, Dolgelley. Also on the Parish Church Memorial. Enlisted in Norwich. Buried in St. Sever Cemetery Extension. Rouen. F. 146. (South Street) Private TF/291073 7th Battalion, The Royal Welsh Fusiliers. 53rd Welsh Division. Killed in action at the 3rd Battle of Gaza 6th November 1917. Aged 22. Son of Elizabeth Williams of Wesley Court, South Street, Dolgelley Born in Dyffryn and enlisted in Dolgelley Buried in Beersheba War Cemetery. Palestine. (Fronoleu) Private 39140, ‘D’ Company, 1st Battalion, The South Wales Borderers. 1st Division. Killed in action 22nd July 1918. Aged 24. Son of John and Anne Price of ‘Fronoleu’ Dolgelley. Born in Dolgelley and enlisted in Newport. Buried in Cambrin Military Cemetery. F. 163. (Tynymyndd) Private 2528, 1st Battalion, The Welsh Guards. The Guards Division. Wounded in action on the Somme, died 22nd September 1916. Aged 22. Son of Mr. and Mrs. Hugh Pugh of Tynymyndd Cottage, Brithdir, Dolgelley. Born in Brithdir and enlisted in Mountain Ash. Buried in St. Sever Cemetery, Rouen. F. 141. (South Street) Sapper 79934, 176th Field Company, The Royal Engineers. Died on active service 25th October 1915. Aged 25. Husband of Hannah Pugh, who remarried and was living in Carnarvon. Born and enlisted in Dolgelley. Buried in St. Venant Communal Cemetery F. 495. (Hendregefeilliaid) Private TF/291412, 7th Battalion, The Royal Welsh Fusiliers. 53rd Welsh Division. Killed in action at the First Battle of Gaza 26th March 1917. Born Brithdir, and enlisted in Dolgelly. Commemorated on The Jerusalem Memorial, MR. 34. (Helygog) Flying Officer, Number 5 Squadron, Royal Air Force. Indian Units. Died on active service 16th April 1920. Aged 21. Son of Robert and Jane Mary Pughe of ‘Helygog’ Dolgelley. Buried in Loralai Cemetery 14, India. Commemorated on The Delhi Memorial (India Gate) MR. 43. (Sarn Road) Private TF/241375, 1/5th Battalion, The Royal West Surrey Regiment. Indian Army. Died on active service in India 21st November 1917. Aged 28. Born in Dolgelley, enlisted Wimbledon. Son of Mr. and Mrs. John Isaac Roberts. Husband of Florence Roberts 15, Balfour Road, Wimbledon. Buried in Bolarum Cavalry Barracks Cemetery. Commemorated on The Madras Memorial, Chennai, India. MR. 66. (Tallyrafon Buildings) Corporal 15100, 2nd Battalion, The Royal Welsh Fusiliers. 38th Division. Killed in action near Loos 6th July 1916. Husband of Mrs. Frances Lily Roberts of Bushey Dairy, Corfe Castle, Dorset. Born and enlisted in Dolgelley. Name also recorded on The Memorial in Corfe Castle Parish Church and recreation ground Memorial gates. Commemorated on The Loos Memorial MR. 19. (Tallyrafon Buildings) Private 61051, 15th Battalion, The Royal Welsh Fusiliers. 38th Division. Killed in action in The Ypres Salient 25th July 1917. Aged 25. Son of Mr. and Mrs. John Roberts of Tyisaf, Llanuwchllyn, Husband of Margaret Roberts of Bodiwan, Bala. Born in Llanfyllin, Montgomeryshire, enlisted Dolgelley. Buried in Artillery Wood Cemetery, Ypres, Belgium. B. 106. (Cambrian House) Private 78530, 9th Battalion, The Tank Corps. Killed in action 25th March 1918. Born in Chester and enlisted in Dolgelley. Commemorated on The Pozieres Memorial MR. 27. (Cader Road) Private 9520, 2nd Battalion, The Welsh Regiment. 1st Regular Division. Died of wounds 2nd January 1915 in France. Aged 29. Son of David and Emma Roberts of Dolgelley. 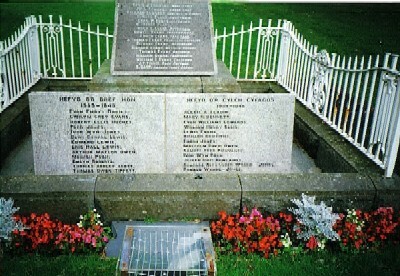 Parish Church Memorial. Born and enlisted in Dolgelley Buried in Lillers Communal Cemetery. F. 201. (Clogwyn) Lieutenant, The Westmoreland and Cumberland Yeomanry. Died at home 13th January 1918. Buried in Llanedwen (St. Edwen) Churchyard, Anglesey. (Tynllidiart) Private 2850, 7th Battalion, The Royal Welsh Fusiliers. 53rd Welsh Division. Killed in action at Suvla Bay 10th August 1915. Aged 22. Son of Thomas and Emily Roberts of Ysgubor, Dolgelley. Enlisted in Dolgelley. Commemorated on The Helles Memorial, Gallipoli. MR. 4. (Hafodymeirch) Private 2186, 1st Battalion, The Welsh Guards. The Guards Division. Died in France 11th September 1916. Born Brithdir and enlisted in Dolgelley. Buried in Allonville Communal Cemetery. (Bodlondeb) Rifleman 2541, 1/6th Battalion, The Kings Liverpool Regiment. 5th Division. Killed in action at Hill 60, 5th May 1915. Aged 19. Son of Mr. F. W. and Mrs. M. E. Ruddle of 28, Darwin Road, Southampton Enlisted in Liverpool. Resident of Bootle. Commemorated on The Menin Gate Memorial, Ypres, Belgium Mr. 29. (Park Lane) Forewoman 7820, Queen Mary’s Army Auxilliary Corps. Died at home on the 21st August 1918. Aged 42. Born in Dolgelley and enlisted in Wrexham. Buried in Dolgelley (St. Mary) Churchyard Extension. (14, English Terrace) Private 64370, 9th Battalion, The Welsh Regiment. 19th Division. Killed in action 24th March 1918. Aged 19. Born in Prestain Radnor, and enlisted in Shrewsbury. Son of John and Ellen Watkins of 14, English Terrace, Dolgelley. Buried in Bancourt British Cemetery F. 307. (Clyn-Afon) Private 141568, 20th Battalion, The Machine Gun Corps (Infantry). Killed in action during the German Spring offensive on 22nd March 1918. Born Dolgelley and enlisted in Liverpool. Commemorated on The Pozieres Memorial. MR, 27. (Upper Court) Private TF/241673, 1/5th Battalion, The Welsh Regiment. 53rd Division. Killed in action at The First Battle of Gaza 26th March 1917. Aged 28. Husband of Mrs. Ellen Williams of 9, Rock Terrace, Old Ynysybwl, Ynysybw, Pontyridd, Glamorganshire. Born in Dolgelley and enlisted in Pontypridd. Commemorated on The Jerusalem Memorial, Palestine. MR. 34. (Chapel Buildings) Private TF/291911, 7th Battalion, The Royal Welsh Fusiliers. 53rd Welsh Division. Drowned in SS ‘Cameronia’ 15th April 1917. Torpedoed East of Malta. Also on the Parish Church Memorial. Born and enlisted in Dolgelley. 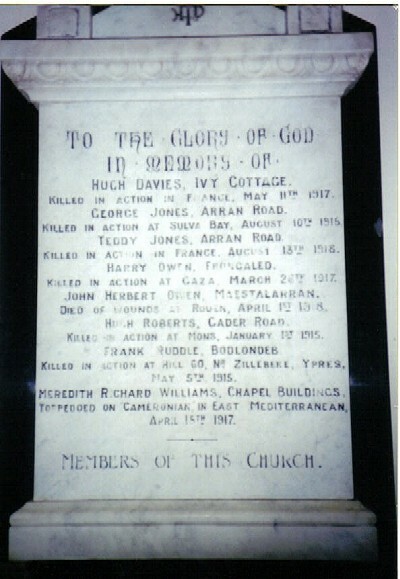 Commemorated on The Chatby Memorial, Alexandria, Egypt. (Mount Pleasant Road) Private TF/291579, 15th Battalion, The Royal Welsh Fusiliers, 38th Division. Killed in action at Ypres 4th August 1917. Aged 27. Son of Evan Owen and Mary E. Williams of Aberllefenni Farm, Aberllefenni, Corris Merioneth. Born Aberllefenni and enlisted in Dolgelley. Commemorated on The Menin Gate Memorial, Ypres. MR. 29. (Rhydymain) Private 60926, 2nd Battalion, The Royal Welsh Fusiliers. 38th Welsh Division Died of wounds 21st September 1918. Born in Llanuwcllyn and enlisted in Dolgelley. Buried in Thilloy Road Cemetery, Beaulencourt F. 278. Sub Lieutenant (A), H.M.S. “Jackdaw”, Royal Naval Volunteer Reserve Fleet Air Arm. RNAS Crail, Fife, Scotland. Killed on active service 2nd January 1945. Aged 21. Son of Alexis Theodoravich & Florence Irene, Aladin. Commemorated on The Lee on Solent Fleet Air Arm Memorial. Junior Commander 218699, Auxilliary Territorial Service, Died in Naples, Italy 8th August 1944. Aged 28. Daughter of Dr. Robert Allan Bennett MD. (Lond) MRCP. & Mrs Gladys Rosamund Bennett of West Kensington, London. Buried in Naples War Cemetery, Italy. Private 4195553, 4th Battalion, Border Regiment. Killed in action near Imphal, India 28th July 1944. Aged 26. Son of Evan Rees and Margaret Sarah Davies of Dolgellau, Merionethshire. Buried in Imphal War Cemetery. Captain, 11th Battalion, Royal Welsh Fusiliers. Died at home 2nd September 1944. Aged 51. Son of William & Elizabeth Edwards. Husband of Violet Anne Edwards of Dolgellau. Buried in Llanelltyd Cemetery. Private 4208436, 1st Battalion, Parachute Regiment, A.A.C. Died at home 16th April1945. Aged 20. Son of Griffith & Elizabeth Catherine Evans of Dolgellau, Merionethshire. Buried in Dolgellau Nonconformist Cemetery. Sergeant 1212800, No 165 Squadron, R.A.F.V.R. Killed in action in Malta 21st July 1942. Aged 23. Son of Rowland & Magdalene Evan of Brithdir, Merionethshire Commemorated on The Malta Memorial. Private 4207134, Royal Army Ordnance Corps. Iraq. Died 12th June 1942. Aged 32. Son of Evan & Gwen Griffiths. Husband of Kate Griffiths of Ganllwyd, Merionethshire. Commemorated on The Basra Memorial, Iraq. Private 4185930, 1st Battalion, The South Staffordshire Regiment. Died in India 14th January 1945. Aged 36. Son of William & Mary Alice Hughes. Husband of Bertha Hughes of Coventry. Buried in Kirkee War Cemetery, India. Trooper 7909228, 142nd Regiment (7th Suffolk) Royal Armoured Corps. Killed in action in Algeria 22nd April 1943. Aged 23. Son of William & Elizabeth Jones of Dolgellau. Buried in El Alia Cemetery, Algeria. Lieutenant 73168 1st. Battalion, The Kings Royal Rifle Corps. Killed in action in Egypt 7. 4.41. Aged 23 Son of Major & Mrs Charles Wynne –Jones of Dolgellau, Merionethshire. Commemorated on The Alamein Memorial. Lieutenant 132569, Royal Armoured Corps (Royal Dragoons). Killed in action in Egypt 13th January 1942. Aged 22. Son of Major & Mrs Charles Wynne-Jones of Dolgellau, Merionethshire. Commemorated on The Alamein Memorial, Egypt. Sergeant 983657, 301st Field Regiment, East African Artillery. Lost with most of the men of the battery when the troopship “Khedive Ismail” was torpedoed on route to Ceylon in the Indian Ocean 12th February 1944. Aged 23. Son of John & Mary Anne Lewis of Dolgellau, Merionethshire. Commemorated on The East Africa Memorial, Nairobi, Kenya. Fusilier 4195139, 1st Battalion, Royal Welsh Fusiliers. Killed in action in Burma 18th March 1943. Aged 23. Son of Lewis & Kate Anne Lewis of Dolgellau, Merionethshire. Commemorated on The Rangoon Memorial, Burma. Sergeant-Pilot 742226, Royal Air Force Volunteer Reserve. Died at home 17th February 1941. Aged 25. Son of Morgam Maelor & Mabel Jane Owen of Dolgellau. Husband of Mary Gertrude Owen of Longton, Staffs. Buried in Nonconformist Cemetery, Dolgellau. Merionethshire. Leading Seaman D/JX/143645, H.M. Submarine “Traveller”. Royal Navy. Lost when the submarine failed to return from an operation in the Meditteranean 12th December 1942. Cause of loss, unknown. Son of Jack & Lilian Pickvance. Husband of Doris Pickvance of Whalley Range, Lancashire. Commemorated on The Plymouth Royal Naval Memorial. Sergeant Flight Engineer 1583491, No 427 Bomber Squadron (Hailfax’s) R.C.A.F. Royal Air Force Volunteer Reserve. Killed in action over Germany 18th August 1943. Aged 19. Son of Hugh & Catherine Pugh of Bontddu, Merionethshire, Buried in Berlin 1939/45 War Cemetery, Germany. Private 14411528, 4th Battalion, The Welsh Regiment. Died at home 27th September 1944. Aged 19. Son of Edward & Elizabeth Pugh of Dolgellau. Buried in Nonconformist Cemetery, Dolgellau. Fusilier 4195636, Royal Welsh Fusiliers (Pioneer Corps) Lost when the SS “Lancastria” was bombed and sunk off St. Nazaire, France 17th June 1940. Aged 20. Son of Christmas & Ila Mary Rowlands of Dolgellau, Merionethshire. Buried in Les Moutiers-en-Retz Communal Cemetery. Lieutenant 90701, 1st Battalion, The Royal Berkshire Regiment. Died at home 8th July 1940. Aged 30. Son of Herbert Bodley & Sybil Claudia Jane Scott. Husband of Muriel Scott of Dolgellau. Solicitor. Educated at Cambridge (BA) Buried in Scarborough (Manor Road) Cemetery, Yorkshire. Private 4194590, 6th Battalion, (10th Royal Welsh Fusiliers) The Parachute Regiment A.A.C. Killed in action in Italy 10th September 1943 Aged 21. Son of Edward Foulkes & Anne Mary Tippett of Dolgellau, Merionethshire. Buried in Bari War Cemetery, Italy.